I was walking down the aisle in Lowe’s the other day and passed by the wall of garden shears. After many nights of endless research on the different styles and brands of garden shears, I knew what I was looking at. Here were pairs of scissors designed for a few uses each year. Every feature yelled out the word ‘cheap’, from the flimsy blades, the ugly safety clip, the bland and thin handles, I just knew that these were not the pair that professional trimmer’s should be buying. Think about it, Granny’s nationwide buy the eye level brand because they are cheap, easy to see on the shelf and designed exactly for what they want to do, which is to prune their rosebush a few times a year. If you have a pile of buds to clip why are you using inferior blades? It’s sort of like playing a beautiful classical piece of music on a Toys R’ Us keyboard. PRO420 Scissors are the ideal choice for serious trimmers. They are incredibly comfortable to use, feel like quality, look like quality and have a handful of special design features that any trimmer will cherish. They are the first customized manicure scissors on the market today, brought to you just in time for the PRO420 movement that is sweeping the nation! Let’s be honest, there are plenty of scissors in the marketplace today designed for gardeners. Multi-purpose snips for $10 are scattered in every shop in America. These scissors are mainly designed for infrequent use to prune garden flowers and shrubs. After a few snips, you break a sweat, go inside, slide the cheap pair of trimmer’s into a drawer, and they don’t see daylight for another 6 months. Those avid gardeners who do actually rely on a quality pair of pruning shears are sorely disappointed with their purchases. Why? Because the scissors simply are not designed for everyday use. The spring falls out, or it rusts, the blades go dull, the handles get worn out, the list of complaints is endless. In fact, we have saved you a bit of time here and collected just a fraction of evidence from Amazon buyer’s feedback for one particular brand of garden scissors, and it is a sad read. I ONLY USED Fiskar soft touch trimmers, pruners, loppers etc. because IMHO they HAD made the best. Most recently I had to replace two pairs of the Soft Touch Pruning Scissors that are approx 8+ years old and had ben sharpened professionally a few times over the years and were my favorite pair, so much so that over the next year or two of buying my first 2 I then purchased 12 more pairs for other gardeners in my family and for some friends. When I received the 2 new pairs I bought I was in shock, right away you can just feel how cheap they feel in comparison to the original model. The old model was made in the USA and Ill assume the new version is not since the imprint “Made in the USA” is no longer on the package/scissor blade. After the 2 full day of use the spring popped on the one pair and the same day while using the 2nd pair the plastic slide which locks the blades popped off as well!! Bought these 2 months ago. Used them them twice; one of the scissors points came off on the 2nd use. Used for green plants only; not woody stems. A complete waste of $. My wife has had the same pair for several years so I thought I would get one.Hers are made in USA this one is made some were else.Looks like they don’t even want to stamp were as they are probably outsourced to whoever will make them the cheapest and the cheapest they are. The locking mechanism broke of after about 10 cuts.Cheap plastic.I do love Amazon as they always so far have stood behind what they advertise or sell and a refund was provided. This pruning snip worked well for a few weeks of light use until one of the blades completely broke off from the base. At first I thought the blade somehow came loose, but on closer inspection the actual blade had snapped off around its base. I wasn’t using it for anything else but cutting some thin plant stems, so maybe the quality of the blade just wasn’t good or was a defective item. the lock/unlock slide, pinches hand between the slide lock and against the other handle (the lock slide stays attached to one side, sliding up and down, and it pinches skin against the other handle when using cutters whether the slide is in lock or unlock mode, it pinches in either position when cutting or pruning). they are not as sharp as other brands either. just not a commercial or ‘use on a regular basis’ type of product. the pinching will make you throw them in the garbage, the cutting is actually not too bad, but i only use these for emergency, when i can’t find my other pair. It is not sharp. I have a hard time clipping small branches. The worst part is that I have hurt myself, where my fingers have been caught in the closing area. On the other hand, it is hard to close. I would have preferred that it did not close, and just came in a protect cover. However, it has to close to fit in the protective cover. In hindsight, I should have purchased a heavier duty pruner. Well, there you have it, from the fingertips of gardeners coast to coast. 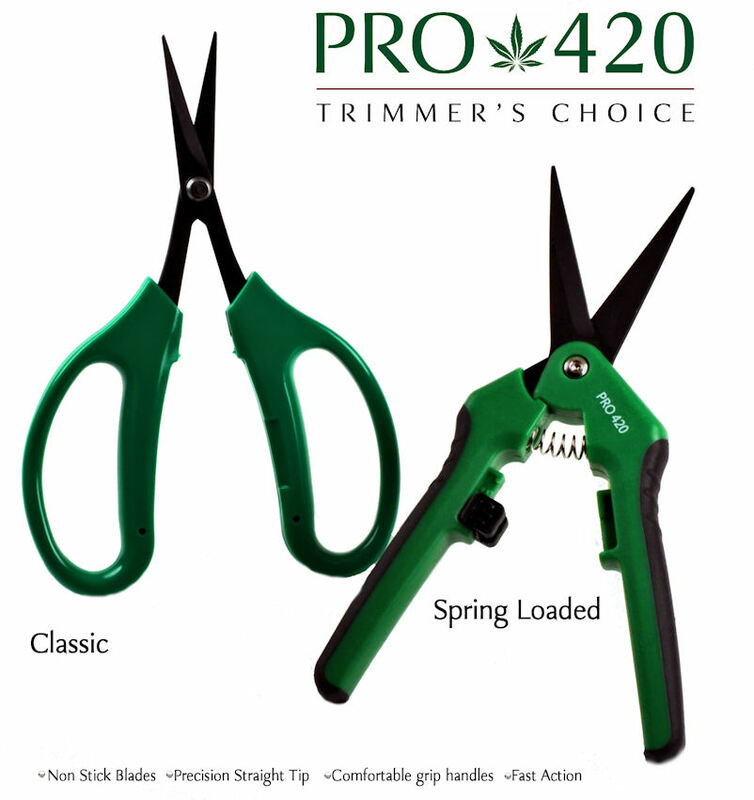 PRO420 Manicure scissors are designed specifically for trimming Marijuana and other fine herbs. The specialized features will help every gardener accomplish the task at hand without a hitch. We sourced quality implements, customized them with special features, and deliver them to the evolving medical and legal marijuana industry worldwide. Give them a try and let us know what you think. So far the reviews from our associates are through the roof positive. Right out of the package PRO420 scissors feel like quality implements, perform like quality implements should, and will surely be a talking point at any trim scene they show up in. If you want to save a few bucks and buy a pair of garden snips designed for grannies and their rose bushes, be our guests. But we would much prefer that you treat yourself to the best garden shears available for the detailed work of manicuring Marijuana, go on, give PRO420 Professional Manicure Scissors a shot and you will never look back! What are the best scissors for trimming buds? Well, it comes down to many factors, including your personal preferences, the amount of flowers needing to be trimmed and how fast you want to finish. One thing is for sure, your common household scissors are not the ideal pair for this task. Large blades can damage buds with one cut, and small handles can damage hands and create blisters. Besides, you don’t want to ruin your kitchen scissors or craft scissors performing a task they are not designed for. Many trimmers who work long hours prefer spring loaded shears to reduce the strain of having to make each cut manually. They also do not enjoy the fact that every few minutes they have to stop and clean the scissors. With this in mind, PRO420 manicure scissors have a unique non-stick coating that is not commonly found on household scissors. This will not completely stop the buildup of resin, but it will greatly reduce the accumulation and help you finish your trimming work faster. For these reasons the PRO420 Spring Loaded Scissors are the ideal choice. They offer stainless steel straight tip blades for a precision trim and an easy grip spring loaded handle to reduce strain. The blades have a non-stick coating that reduce resinous buildup and allow you to work for longer periods. The PRO420 Spring Loaded Scissors are economical, lightweight quality blades produced by a leading manufacturer of garden implements. The PRO420 Classic Scissors are much the same, only without the spring loaded handle. Many professional trimmers prefer to make each cut individually. The Classics have a curved blade from the base, allowing you to cut away from your hand while making precision cuts. They offer a large equal sized handle for comfortable maneuvering, reducing the risk of blisters or pain. They also come with a non-stick coating to help you keep working without having to clean the blade as often. The Classics are lightweight quality scissors produced by a leading manufacturer of garden implements. The Bundle is a combination package of 3 Classics and 1 Spring Loaded that will save you money and help you work more efficiently. Not only will you be able to clean one pair and continue working with a fresh pair, but friends and family will also be able to help out with an extra pair of top quality precision blades. Scissor Bud-e Cleaning Solution is a convenient way to clean your scissors quickly and without a mess. Simply dip the scissors in the slots within the sponge filling, and watch them slide out crystal clean. The jar is comprised of a sponge soaked in food grade hemp oil that cleans the scissors very efficiently. It is designed to withstand over 400 cleanings and will save you precious time while trimming. We also recommend that you use the Spring Loaded Scissors to cut the buds from the stalk and for removing the larger shade leaves from the plant. Their precision cuts will allow you to produce aesthetically pleasing crystal nuggets of wonder. The Classic scissors are ideal for cutting away the smaller leaves at their base, from deep within each bud. Each manual cut will clean up the flower and make it very presentable. So the answer is simple, PRO420 is the obvious choice when it comes to quality precision scissors for manicuring Cannabis. We are focused solely on providing the evolving Medical and Legal Marijuana industry with two of the most popular designs for trimmers, and for this PRO420 is the Trimmer’s Choice!